Original composer and performer on bouzouki, drop D guitar and ukulele. Bouzouki and ukelele player Jon Sanders is to release his third solo album, Zoukelele, a musical journey through North African, Arabic, Celtic, Eastern European and Mississippi swampland inspired sounds on ngoni uke and guizouki with an orchestra of guest musicians from around the globe. This collection further stamps Jon's place as a musician known for his "quantum leaping" approach to sound and composition. "These last four years have been a great opportunity for me to develop fresh and radical sounds that aren't found in the musical mainstream and that celebrate the diversity of different cultures. There is singing in Bulgarian, English, French and the Mali Bambara language on this album. The ngoni uke instrument sound I have developed is truly inspired by my love for the rhythms and melodies of Mali while  the guizouki sounds indulge in the virtuosity of this bouzouki/guitar hybrid instrument. There's also a soulful and spiritual thread to this musical journey that will appeal to dancers and meditators alike," he says. Following the success of 2010's bouzouki and ukelele collection Twigs of the Neem Tree, Jon developed the ngoni uke - a ukelele played upside down in various turnings in blue grass style to emulate the sounds of the smaller ngoni African harp, a skin and wood uke-sized  instrument popular in Mali, Africa. The result is a captivating harp-like trance sound, matched on the album by Martin Schaerer's lively percussion. "I am fascinated by the Ethiojazz music scene in Addis Ababa of the late 1970's which fused traditional Ethiopian music scales with the emerging jazz sounds of the day led by Mulatu Astatke. On the album, I've used Hammond organ and upright bass alongside with ngoni uke to capture this feel," says the Irish/NZ based performer. There are also new Arabic and Celtic derived tracks on his guitar/bouzouki hybrid instrument known as the guizouki, a four double-stringed bouzouki-necked instrument matched to a cutaway guitar body which gives a full bodied ethnic string sound. Matched by Australian percussionist Greg Sheehan's iconic tambarine and Brendan Power's virtuoso harmonica, tracks like Seven Into Four take the listener further on the albums soundscape journey while the opener Plozevet Pulse takes the listener from a small Breton town in northwest France to the Mali heartland and back again! Guesting on the album are Polish singer Gosia Koscielniak, Irish whistle and flute player Alan Doherty (Grada), Greg Sheehan on percussion (AUS), Brendan Power on harmonicas (New Zealand/UK), Martin Schaerer on percussion (Switz), Jeremy Spencer on fiddle (IRL), Sam Hagmann (Switz) on trumpet/flugelhorn, Youlia Zidaravo (Bulgaria) on vocals and New Zealanders Dave Khan and Dave Alley on guitars. Jon plays guitar, guizouki, tenor uke, ngoni uke, upright bass, Hammond organ, piano and vocals. 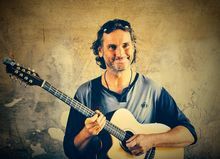 Jon will launch Zoukelele in October 2014 and tour through Europe at selected venues until the end of the year, then tour in NZ nationwide from January to March 2015. Tour dates and the album are available at www.jon-sanders.com and at www.cdbaby.com. Also download on iTunes. For more information and bookings email jonsanders6@yahoo.com.